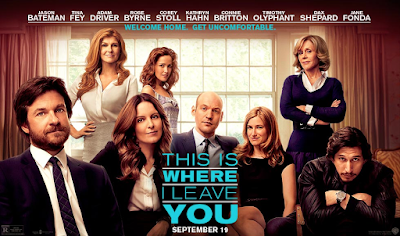 THIS IS WHERE I LEAVE YOU is a brutally unfunny and deadly dull dramedy from director Shawn Levy (DATE NIGHT) and writer-novelist Jonathan Tropper (BANSHEE). The high concept is that four adult siblings are forced by their mother to sit shiva for their recently deceased father, and that in the course of those seven days of mourning they will explore their relationships. The movie stars and is told from the perspective of Jason Bateman's character Judd. His secret is that his wife has left him and over the course of the week he's going to have a kind of mid-life crisis and resolution with the help of the conveniently available and understanding hometown girl (Rose Byrne.) Next up is his sister Wendy (Tina Fey) trapped in an unhappy marriage. Then comes Judd's brother Paul (Corey Stoll - HOUSE OF CARDS) who's wife is struggling to get pregnant, raising tensions with Judd who is her ex. Finally we have youngest brother Phillip (Adam Driver - GIRLS) who's widely regarded by the rest of the family as feckless and irresponsible but who actually turns out to be the most grounded and self-aware, even in his relationship with a much older women (Connie Britton - NASHVILLE). This is that kind of gentle middle-class dramedy in which all problems involve marriage and can be fixed with a simple bonding session over a mildly subversive drug and tied together with a politically correct bow at the end. There's no deep emotional truth here, only an attempt at pretending to be interested in it. The acting is fine, the lens-work workmanlike, and the characters utterly unmemorable. I imagine this film might appeal to the kind of people who enjoyed EAT, PRAY, LOVE. THIS IS WHERE I LEAVE YOU has a running time of 103 minutes and is rated R. The movie played Toronto 2014 and was released earlier this year in the USA, UAE, Slovenia, Chile, Singapore, Bahamas, Canada, Mexico, Taiwan, Trinidad and Tobago, Aruba, Switzerland, Colombia, Germany, Guatemala, Honduras, Austria, Panama, Paraguay, Spain, Finland and South Africa. It opened this weekend in the UK, Ireland, Latvia, Turkey, Australia, Croatia, Israel and New Zealand. It opens in November in India, Czech Republic, Portugal, Brazil and Italy; in December in Azerbaijan, Kazakhstan, Russia, Slovakia, Ukraine, Cyprus, Poland, Romania, Argentina, Uruguay, Bulgaria, Philippines, Peru and Serbia; in January 2015 in Denmark, Norway and Belgium.